This week there will be much lighting of candles around the world. Jews will begin lighting Chanukah candles on Tuesday at sundown, and will continue for 8 days. In many parts of the world candles are also intimately associated with Christmas, coming as it does, at least in the Northern hemisphere, at the darkest time of the year, when even the tiny light of a candle makes a difference. This year, there will be a particular resonance to my candle-lighting during Chanukah. At a time when Israel truly feels overcome with the darkness of hatred and violence, both towards Muslims and even towards Jews who dare to think differently, this Chanukah will see the launch of an initiative moving towards the light, and refusing to condone the actions of those who use the darkness of night to conceal their reprehensible acts. Each night during Chanukah there will be a candle-lighting event to support peaceful relations between Jews, Muslims and Christians in different parts of the country – at the various sites where Jewish extremists have perpetrated acts of ‘Tag Mechir’ terror over the course of the past months – whether the burning of mosques, the assaults on army officers or the attacks on peace activists. In Jerusalem, Tuba Zangaria and Yafo, in Palestinian villages and in the midst of Jewish cities, we will speak out against Tag Mechir – Price Tag – and in favour of Tag Meir (doesn’t really translate directly into English – Light Tag perhaps). 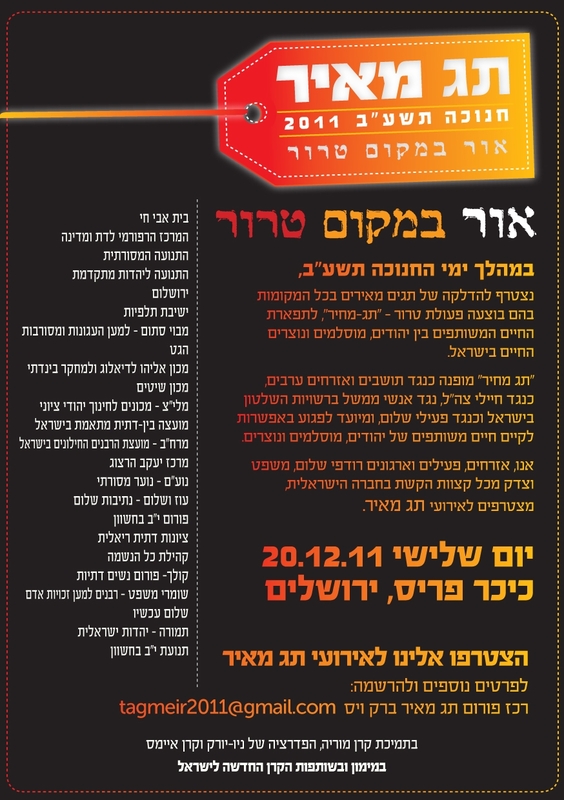 Come join the Jerusalem event on Tuesday night, the first night of Chanukah: 19:00 outside the Prime Minister’s House. The rest of the week’s events will be posted shortly on facebook. The good news is that I believe that the vast majority of the population of Israel is appalled by the acts of Tag Mechir. When my daughter’s high school put together a letter of solidarity with the village of Tuba Zangaria, whose mosque was burned at the beginning of October, a record number of parents signed the letter and expressed their outrage at the targeting of a place of worship. At the time, I was struck that this mosque burning seemed to strike a chord that previous events had not – possibly because this time the mosque was in a village in Israel, as opposed to on the West Bank. Looking back, perhaps I should see this too as a positive sign – in the sense that, for most middle-of-the-road Israelis, there is still a distinction to be made between Israel and the areas over the green line: despite the best efforts of the settler groups, and despite the encroachments being made on public consciousness in this regard, most common-or-garden Israelis don’t see the West Bank as part of Israel proper. Many Israelis therefore see the West Bank as something of a Wild West in terms of law and order, not subject to the same rules and norms of behaviour as Israel itself. Israel should certainly be held accountable for upholding law and order in all areas under our control. The fact (and recent newspaper stories suggest that it may well be fact) that the West Bank is indeed the Wild West with bands of settler extremists waging a war of terror against Palestinians attempting to farm their land, and even against the Jewish soldiers sent there to protect them, is completely unacceptable on any level, and the Israeli government must take responsibility for upholding the rule of law against all those who subvert it. Yet I am encouraged by the signs that most Israelis still make this distinction – there is hope, however small, to be found in that. Enough of sitting in our armchairs complaining. Let’s take to the streets and create a strong light together. On Sunday night I will participate in another type of Chanuka lighting – this time in protest at the banishment of women from public space. There will be an women’s lighting in Zion Square in Jerusalem at 17:00 when women will gather to light the candles and sing together – as we continue the ongoing efforts to re-claim public space for women.